Portland, Oregon is a city I’ve yet to visit (with the exception of a airport stop en route to Thailand years ago, but that doesn’t really count and I digress). Until recently it was completely off my radar. But over the last few months it’s been like a magnetic field, pulling me and dynamic, creative minds in proximity. Last year, while working on a project with artist and designer Dimeji Onafuwa (a longtime collaborator with me AND graphic designer of my book and exhibit), he said his family was relocating to Portland. Surprised, I pressed him to tell me about Portland and its appeal. Dimeji spoke fondly of the civic culture, scenery and opportunities. He offered to host me if I ever found myself in the Northwest. Then weeks later, while working on a project with artist and designer Marcus Kiser (also a longtime collaborator), he was excited to share that his exhibit, Intergalactic Soul, might have a showing in Portland. Marcus’s art exhibit brings together science fiction and social awareness—imagination x consciousness. 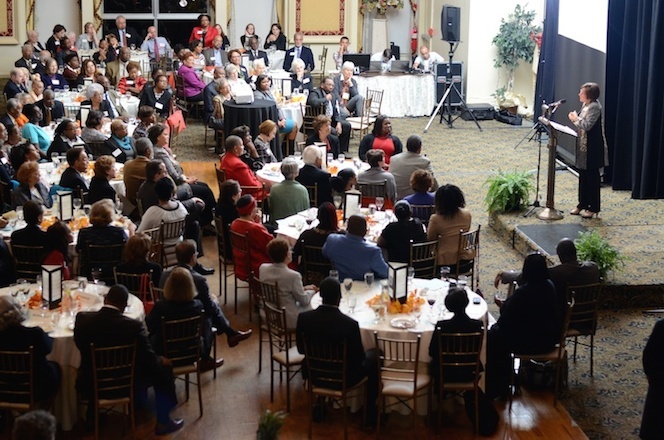 He asked about my experiences with a touring exhibit, and I shared some vendors and wisdom gained from The Soul of Philanthropy Reframed and Exhibited. 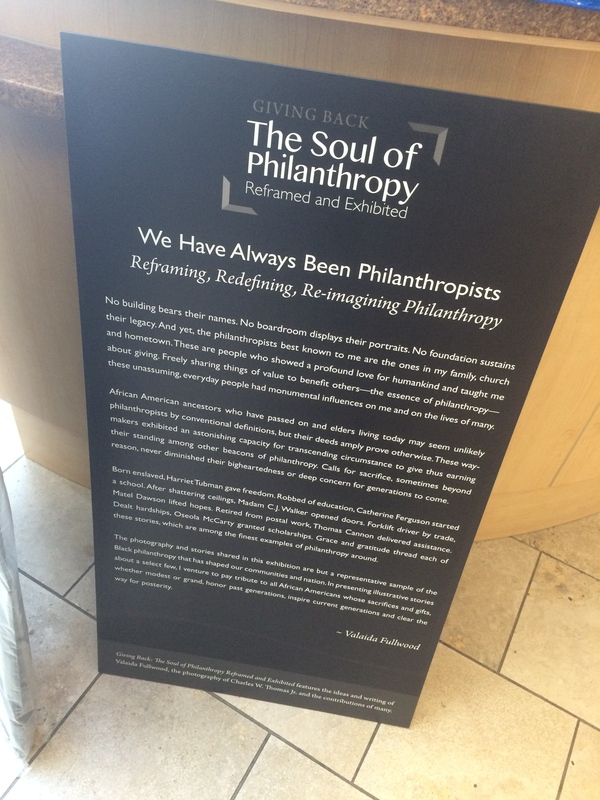 Within days of that conversation, an inquiry about “The Soul of Philanthropy” arrived from Portland’s MRG Foundation—a philanthropic institution working for social change in Oregon communities for 40 years. A few days after that, a second Oregon foundation called about hosting my exhibit in Portland. [cue theme music from The Twilight Zone] “Whoa…what’s up with this reoccurring Portland thing,” I mused. To cut to the chase: It’s now March and last month Marcus, along with artist Jason Woodberry and performer Quentin Talley (who’s another super-longtime collaborator and whose poetry is featured in The Soul of Philanthropy) traveled to Portland for an “Intergalactic Soul” exhibition at Portland Community College, in conjunction with a panel discussion and performance. “The Soul of Philanthropy,” pop-up edition, will be hosted by MRG Foundation and community partners in August—Black Philanthropy Month. Together, MRG Foundation and The Oregon Community Foundation will then host the comprehensive version of “The Soul of Philanthropy” with community-wide programming for three months, starting in January 2017. Whoa, indeed. After fielding a variety of questions about The Soul of Philanthropy from inquiring museums, colleges, community-based nonprofits and funders, instead of a FAQ sheet, I decided to compile images from exhibitions and programs, to date. Since pictures speak a thousand words (at least), photographs provide institutions that are interested in hosting the exhibit a window for visualizing their possibilities. My hope is that the compilation of photos—from the multimedia, comprehensive exhibit and the pop-up, abridged edition—allow people to observe variations and options for installation, based on a venue’s gallery space and the imagination of the exhibition designer. 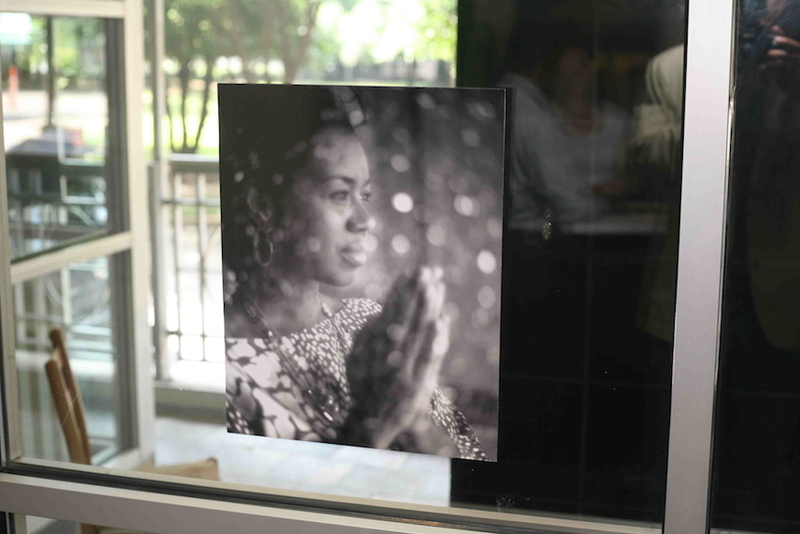 Set to classic soul music, the video speaks volumes about the multimedia exhibit and its public programs that reframe portraits of philanthropy. Please watch, enjoy and share! Note, you can follow my work on The Soul of Philanthropy via Facebook. “Everybody can be great…because anybody can serve. You don’t have to have a college degree to serve. You don’t have to make your subject and verb agree to serve. You only need a heart full of grace. 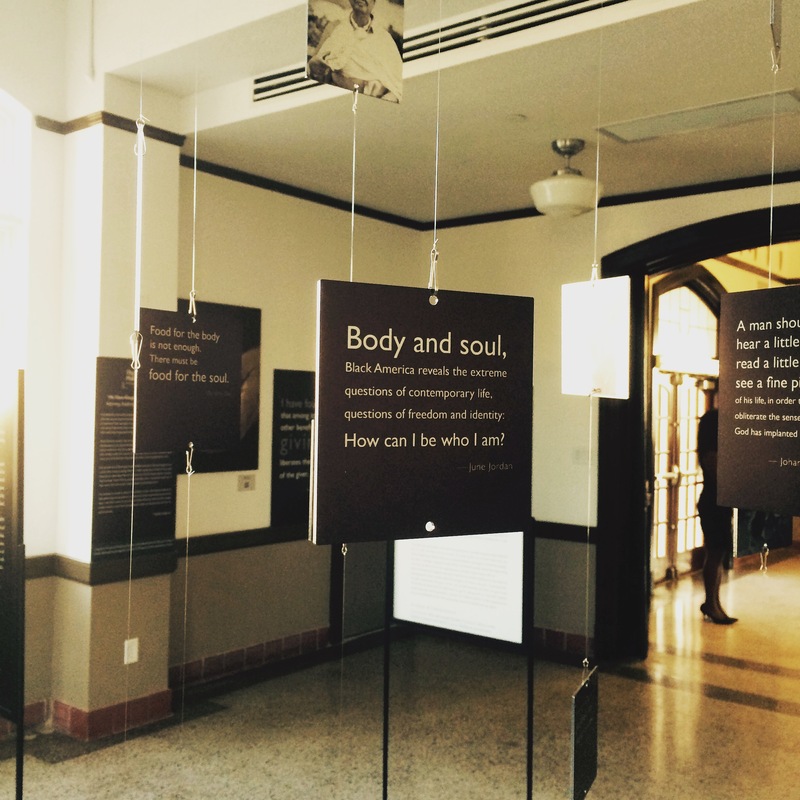 A soul generated by love.” — Dr. Martin Luther King, Jr.
Today Giving Back: The Soul of Philanthropy Reframed and Exhibited, Pop-Up, Abridged Edition, opened at Levine Museum of the New South in Charlotte, North Carolina. Levine Museum of the New South opens the Pop-Up, Abridged Edition of “The Soul of Philanthropy” this weekend. Consequently, this week has been a joy-filled hustle to deliver the exhibit crate, various panels and elements for the show. Read more about it here. Anticipation. Preparation. Exhaustion. It’s feeling like Christmas eve!!! 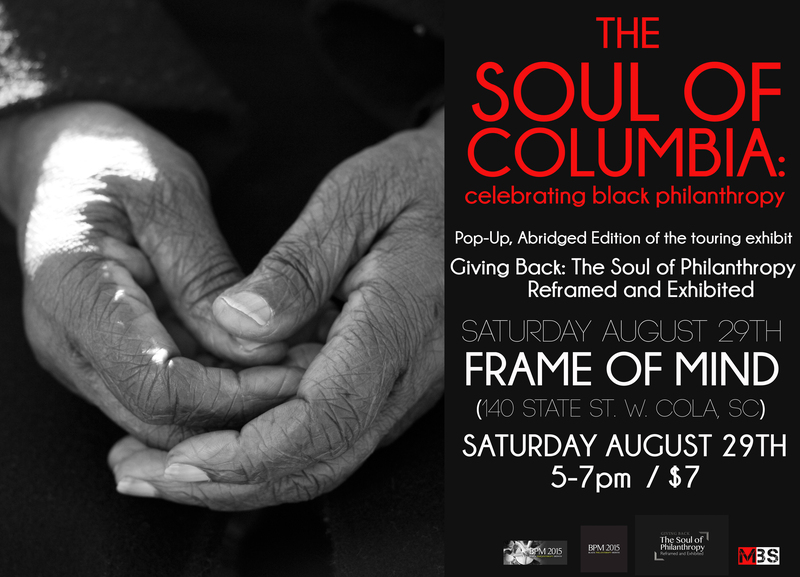 If you’re near Columbia, please come to Frame of Mind—South Carolina’s only eyewear boutique and art gallery hybrid—for a pop-up exhibition of The Soul of Philanthropy, in celebration of Black Philanthropy Month 2015. Program with philanthropy panel discussion, book signing, etc. R.S.V.P. here. Groundbreaking in focus and depth, the new comprehensive, multimedia exhibition Giving Back: The Soul of Philanthropy Reframed and Exhibited is touring the country, presenting inspirational images and stories of generosity among Americans of African descent. Now selected elements of the comprehensive exhibit compose a versatile, compact version, called the Pop-Up, Abridged Edition. Designed to make the exhibit’s content more accessible, the smaller edition can be mounted quickly in nearly any space, adding an engaging arts and culture ambient or focal point when and where people gather—conferences, schools, homes, churches, corporate lobbies, banquet halls, community centers, galleries and more. Twenty black-and-white photographs and narratives provide insight to centuries-old cultural customs and beliefs about giving and generosity that—though rarely referred to as “philanthropy” in Black communities—have long been an integral and transformational force in lives and communities throughout American society. Like the comprehensive exhibit, the Pop-Up, Abridged Edition draws evocative content from the award-winning book Giving Back: A Tribute to Generations of African American Philanthropists, by Valaida Fullwood and photographer Charles W. Thomas Jr. Pop-up exhibitions are the latest innovation of The Giving Back Project, which aims to reframe portraits of philanthropy. Featuring the Pop-Up, Abridged Edition at past special events are Hartford Foundation for Public Giving, Community Investment Network, New Generation of African American Philanthropists and Alpha Phi Alpha Fraternity. New exhibitions at Frame of Mind Gallery in Columbia, SC and Levine Museum of the New South in Charlotte, NC are scheduled. Inquiries about the exhibit can be made here. The Denver opening of Giving Back: The Soul of Philanthropy Reframed and Exhibited, over the August 1st weekend, summed up in photography. 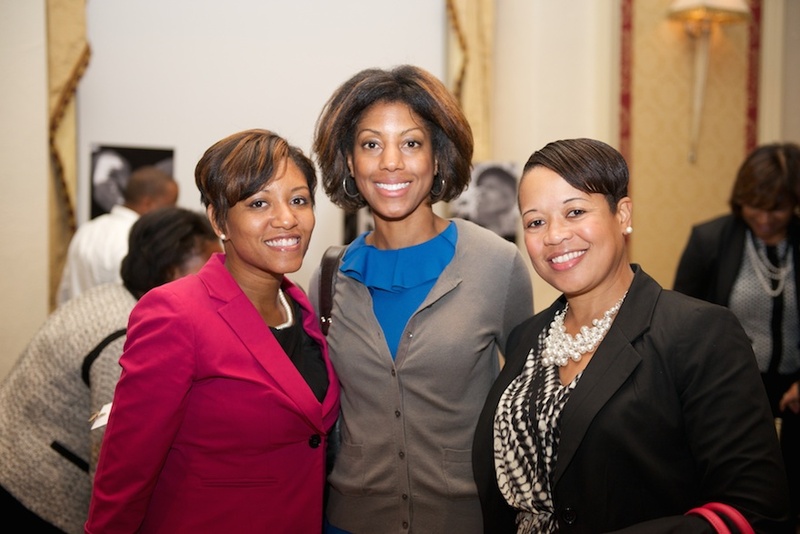 Still reframing portraits of philanthropy!